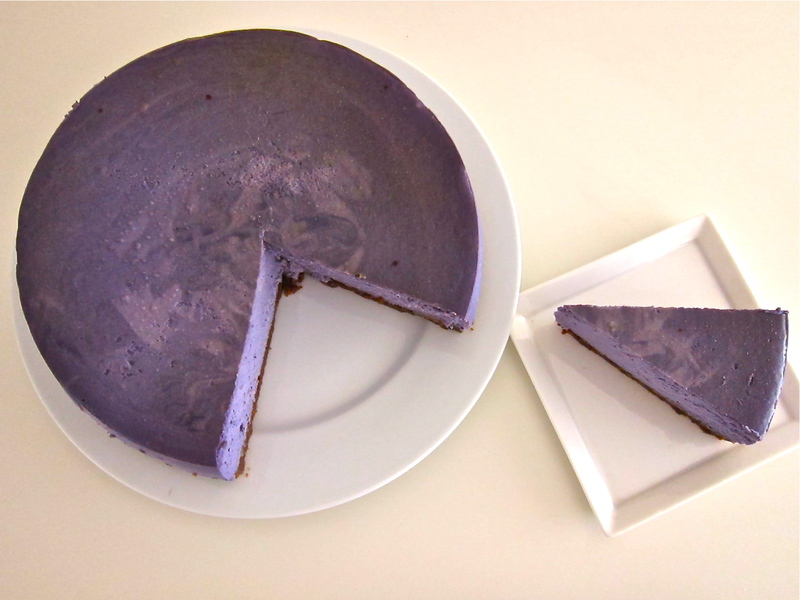 I baked an ube cheesecake yesterday. A whole ube cheesecake. There isn’t a birthday party, office party or any sort of celebration coming up that would need such a cheesecake, but I went ahead and baked it anyways. You see sometimes I just like to bake because there is something so soul-satisfying about spending the afternoon in the kitchen playing with flour, sugar, butter and eggs. 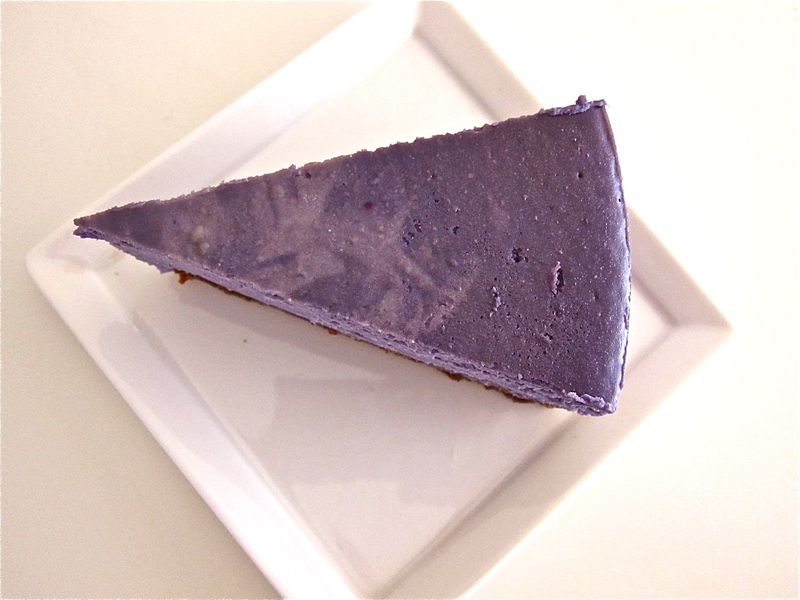 So essentially I just baked a whole ube cheesecake for myself – and it was freakin incredible. I used a ginger cookie crust and studded it with pieces of candied ginger for extra oomph. 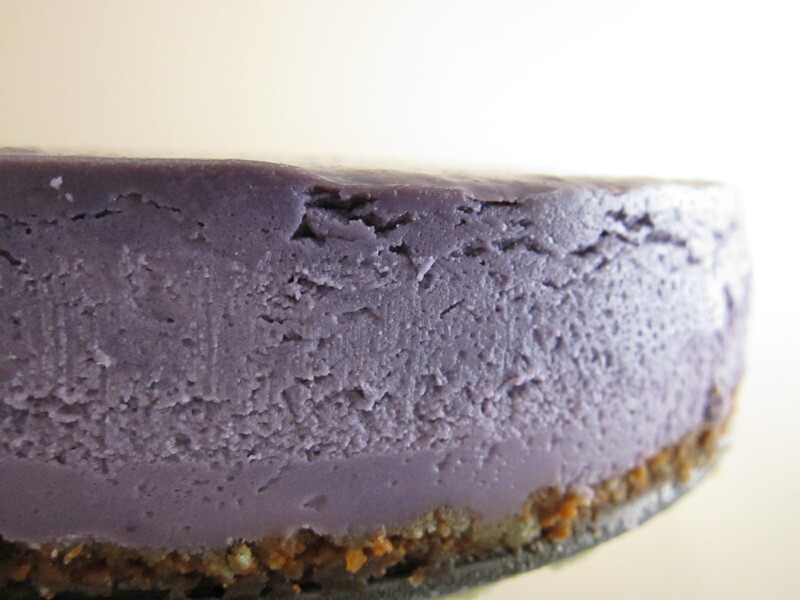 The cheesecake is a gorgeous purple hue from the ube and it has the perfect thick yet yeilding, creamy texture. Each bite fills your mouth with unrelenting waves of ube flavor. It is supremely creamy, rich, tangy and sweet. This is a beautiful classic cheesecake with a Filpino twist. Love ube cupcakes? 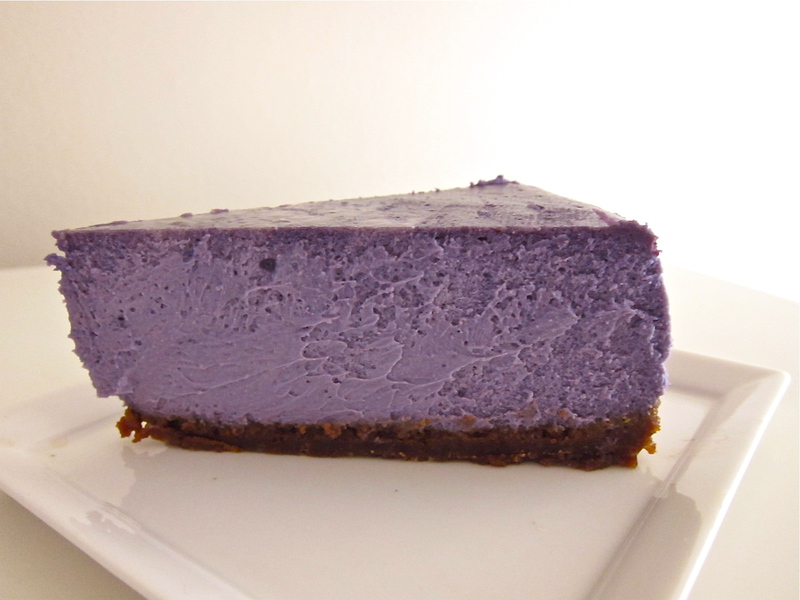 Well then you will love this ube cheesecake and you can even make a coconut sour cream topping for added deliciousness. This recipe is so simple and can be adapted to any flavors or toppings. Go make yourself a whole cheesecake, you deserve it! Put ginger cookie crumbs in the bottom of the spring form pan. Press down the crumbs with your fingers creating an even layer across the bottom of the pan. Place the pan in the oven for 10 minutes or until crust looks fully baked. Remove from oven and let cool while you make the filling. Lower oven temperature to 325 degrees once the crust is baked. Cut the cream cheese into chunks and place it into the bowl of you electric mixer with the paddle attachment. Mix on medium speed for 4 minutes or until cream cheese is smooth. Scrape down the sides of the bowl and add the sugar and mix again on medium speed for another minute or until sugar is incorporated. Add the salt and vanilla extract and mix again for another minute. Scrape down the sides of the bowl and add the ube extract. Miss again until extract is fully incorporated. Add the eggs, one at a time, beating for one minute after each addition. Next, scrape down the bowl and add the sour cream. Mix until incorporated. Add the heavy whipping cream and mix again for another minute. Make sure everything is fully incorporated and there are no cream cheese lumps at the bottom of the bowl. Place the foil wrapped spring form pan into a roasting dish. Pour the cream cheese filling into the pan on top of the ginger cookie crust. Place the pan in the oven and carefully fill the pan with boiling water to create a water bath for the cheesecake. Pour in enough water to reach halfway up the sides of the spring form pan. Cooke at 325 degrees for 1 ½ hours. 10. Cover the top of the cheesecake with foil (do not let foil touch surface of cheesecake) and chill in refrigerator for at least 4 hours or overnight. For coconut sour cream topping mix ingredients and chill. Top cheesecake when ready to serve. Next PostNext This Day Calls For Cake! This thing looks so delicious (and I don’t even like cheesecake all that much). The first time I had an ube cupcake, I was so enamored with the color. Feel the same way with this. Not sure I’ve seen a prettier cheesecake! What a beautiful cheesecake, I have never had ube cheesecake before and would love to try it. Gorgeous! The color is so brilliant and I bet the flavor is even better. OMG are you effing kidding me?! I want this immediately! incredible! i love the Filipino twist 🙂 look delish! Wow I’ve never tried ube before but what a magnificent color. I bet this is delicious! Where do I find ube? I don’t even normally like cheesecake that well and these photos are doing a great job of convincing me that I too must make an entire ube cheesecake for myself! Where do you get ube, btw? I have never heard of ube before. That purple color is to die for! Gorgeous! Your cheesecake is so pretty! I love the sound of the ginger crust too but I have no idea what an ube is! Whatever it is I want some. I don’t even know what ube means. Will google and find out. It looks and seems absolutely exoctic. To add to all this mystic – the photos have come out sensational. This looks divine! I’d totally give you my left arm for a slice. Thank you for sharing this recipe! I did try it with some changes. For the crust, I used those Asian butter coconut biscuits that I crumbled and added some sugar, vanilla, butter and coconut flakes…YUM! For the cheesecake, I added some fresh purple yam that I had steamed and then mashed to get a smooth consistency. I also added some macapuno strings (drained the syrup) to the mixture….YUM! Thank you for sharing! Found coconut cookies and coconut macaroons, and used that as base. Saw a suggestion of the macapuno strings, tried that too. Was wondering “when” to put the macapuno strings? In the filling? Top? Bottom? Did top and bottom, we’ll see. Hope it turns out well! Thanks for the recipe!!! How much mashed ube is required for the filling? How big is the springform pan? Thank you for your divine recipe. Can the ube cheesecake be baked the simple way, not using the water bath? Is it okay to freeze the ube cheesecake? Kindly give me your advise. Thank you. I absolutely love the way your ube cheesecake looks. I wanted to try making your recipe, but I don’t have ube extract. However, I do have ube powder and was wondering if you have any tips on how much I can add and where can I add it in the recipe?